Therecent ACS story, Race to the Pump, was linked here earlier in passing, but it deserves a longer look. The story features many of the most prominent scientists and investors in the advanced biofuels race, providing some interesting perspectives. 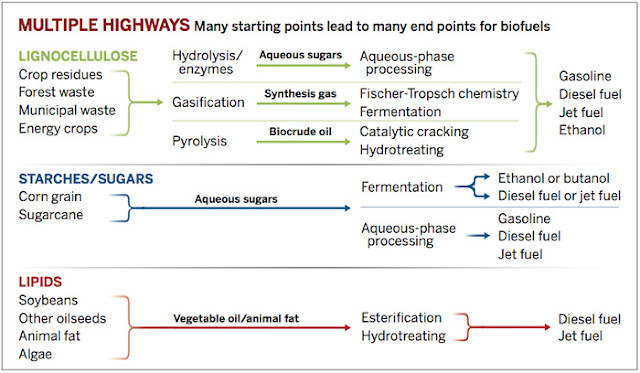 ...Another primary chemical pathway to biofuels is pyrolysis. On this front, George W. Huber and his group at the University of Massachusetts, Amherst, have developed a continuous catalytic pyrolysis method that directly converts raw biomass such as wood chips into gasoline-range compounds. Huber is a former graduate student of Dumesic’s at Wisconsin and part of the team that developed some of Virent’s technology. ...A handful of companies are already zeroing in on commercial biofuels produced by microbes. For example, Gevo, based in Englewood, Colo., uses an engineered microbe to produce 2-methylpropanol, known in the industry as isobutanol, which can be used as a gasoline blend stock or dehydrated to isobutylene and then converted into octane, aromatics, and other gasoline ingredients. The technology is based on research by James C. Liao and coworkers at the University of California, Los Angeles. ...As biofuel technologies proliferate, start-ups and investors must decide which ones are technically and economically feasible on a commercial scale. Decision making typically has focused on how to convert the biomass, but it should be refocused on which raw material should be used, argues Bruce E. Dale, a chemical engineer at Michigan State University and a lead scientist at DOE’s Great Lakes Bioenergy Research Center, one of JBEI’s two sister centers. ...Another factor in decision making is the logistics of biomass availability, transport, and storage. To be commercially viable, a gasification plant would require up to about 15,000 tons of biomass per day, Dale says, whereas a fermentation facility would need about 5,000 tons per day and a pyrolysis facility would need about 2,000 tons per day. To win, companies must work out a long-term, reliable feedstock supply, as well as a partner who will take their fuel, Dale says. ...Khosla thinks that biofuels are one of the most interesting areas in the energy marketplace. That’s because, unlike electric cars, biofuels will be affordable most everywhere. Still, perhaps only half a dozen or so biofuel approaches will win, he said. Khosla instead has his bets on Gevo, LS9, and Amyris. That’s because all three companies have innovative biofuel technologies that they can also use to make high-margin chemical products, thereby reducing risk. ...“When the smoke clears, I think there will be a few technologies left standing,” Mascal agrees. “They will be the ones that can be done cheaply and in which feedstock supplies and their transportation aren’t an issue, capital and operating expenses aren’t prohibitive, and you get a product with a ready or emerging market. The more esoteric methods will be history in the literature. There is much more at the article above. As a quick executive summary, this ACS article is probably the best starting point for understanding where advanced biofuels currently stand, generally. Professor James Clark of the University of York, is taking an interesting approach to extracting high value products from biomass. He is using super-critical CO2 to extract high value waxy products from the biomass, then proceeding to use microwave pyrolysis to produce pyrolysis gas, liquids, and solids. We are approaching prime maple syrup time in North America, and it is good to remember all the different ways that nature has evolved to produce high energy chemicals -- including sugars. With the help of humans, nature is just getting started in the quest to ever higher energy crops.